Objective To evaluate the incidence and consequences of uterine rupture in women who have had a delivery by caesarean section. Data sources Medline, HealthSTAR, Cochrane Database of Systematic Reviews, Cochrane Controlled Trials Register, National Centre for Reviews and Dissemination, reference lists, and national experts. Studies in all languages were eligible if published in full. Review methods Methodological quality was evaluated for each study by using criteria from the United States Preventive Services Task Force and the National Health Service Centre for Reviews and Dissemination. Uterine rupture was categorised as asymptomatic or symptomatic. Results We reviewed 568 full text articles to identify 71 potentially eligible studies, 21 of which were rated at least fair in quality. Compared with elective repeat caesarean delivery, trial of labour increased the risk of uterine rupture by 2.7 (95% confidence interval 0.73 to 4.73) per 1000 cases. No maternal deaths were related to rupture. For women attempting vaginal delivery, the additional risk of perinatal death from rupture of a uterine scar was 1.4 (0 to 9.8) per 10 000 and the additional risk of hysterectomy was 3.4 (0 to 12.6) per 10 000. The rates of asymptomatic uterine rupture in trial of labour and elective repeat caesarean did not differ significantly. Conclusions Although the literature on uterine rupture is imprecise and inconsistent, existing studies indicate that 370 (213 to 1370) elective caesarean deliveries would need to be performed to prevent one symptomatic uterine rupture. We considered controlled trials, cohort studies, case-control studies, and case series with at least 10 cases. We sought studies comparing uterine rupture rates and sequelae in women with low transverse caesarean scar or unclassified scar who chose trial of labour or elective repeat caesarean delivery (ERCD), and if these were not available, non-comparative studies reporting uterine rupture rates and subsequent morbidity or mortality. A study was considered relevant if it was in full manuscript form, included women with low transverse caesarean or unclassified scar, provided data regarding uterine rupture, and had been conducted in a developed country. We excluded studies focusing on particular medical or obstetric conditions (for example, gestational diabetes or pre-eclampsia). Non-English articles with English abstracts were included if they provided information not found in English-language literature. Two investigators independently reviewed random titles and abstracts to establish reliable, reproducible inclusion criteria. Once reliability was established (κ of ≥ 0.80), the primary investigator reviewed the remaining titles and abstracts. 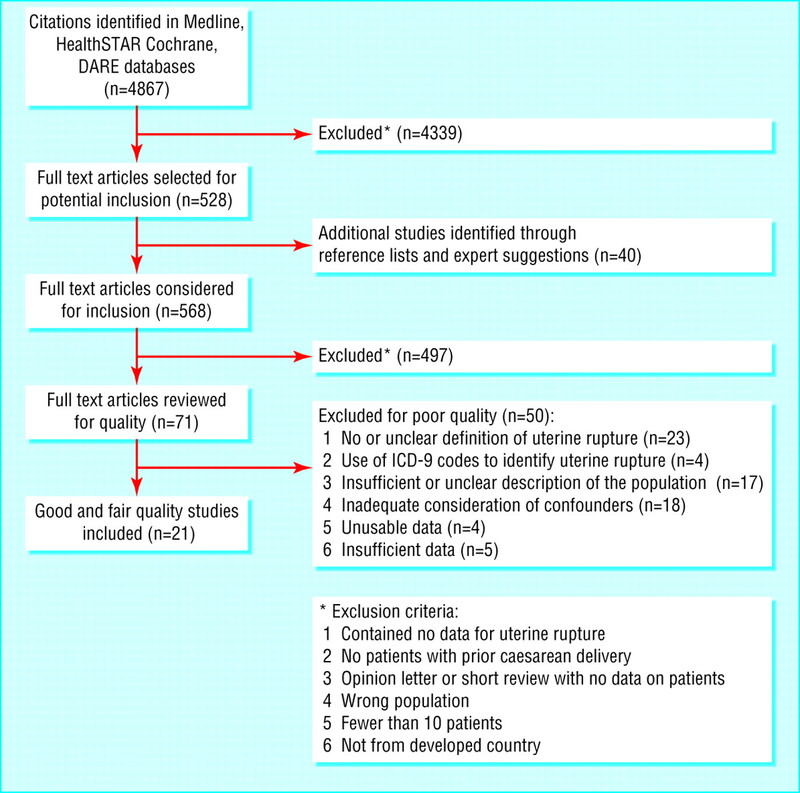 Two investigators independently rated the quality of the study, using criteria from the US Preventive Services Task Force and the NHS Centre for Reviews and Dissemination.9 10 Studies received a poor rating if the groups assembled were not comparable (for example, elective repeat caesarean patients were not eligible for trial of labour); if classification of uterine rupture was unreliable or invalid, or classification was not applied equally among groups; if key confounders, such as number of caesarean deliveries or direction of prior caesarean (vertical or transverse) were given little or no attention; if there was differential attrition or, for randomised control trials, if intention to treat analysis was lacking. Terminology for rupture was inconsistent among studies, yet was crucial for understanding the incidence and consequences of the condition. We used “symptomatic uterine rupture” when uterine separation was diagnosed at laparotomy performed for maternal or fetal signs or symptoms associated with uterine rupture, such as fetal heart rate disturbances or maternal bleeding, and “asymptomatic uterine rupture” for uterine separation without signs or symptoms. 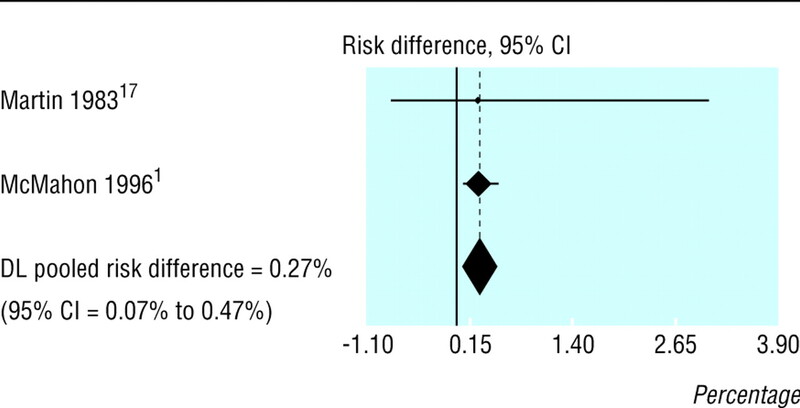 We conducted several meta-analyses to estimate the risks associated with trial of labour and clinical factors that influence risk. Our primary outcomes of interest were the additional absolute risks of symptomatic uterine rupture, and of maternal or perinatal death, or hysterectomy, related to rupture, when trial of labour rather than repeat caesarean delivery was chosen. We were also interested in risks associated with management techniques such as induction or augmentation of labour, as well as signs or symptoms predicting poor outcomes from uterine rupture. 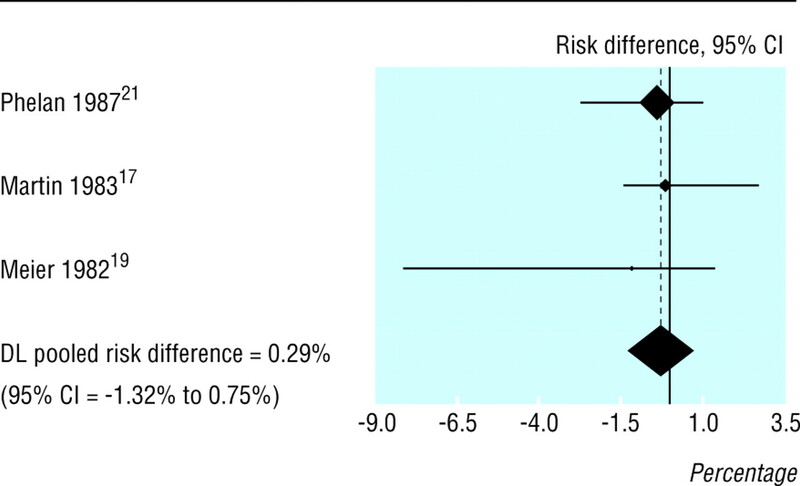 Absolute risk differences and rates were calculated and pooled by random effects and fixed effects models, which weighted studies by the inverse of their variances, giving more weight to precise studies. To reduce bias, we included only studies of fair to good quality. Two investigators independently rated the quality of the study, using criteria from the US Preventive Services Task Force and the NHS Centre for Reviews and Dissemination.9 10 Studies received a poor rating if the groups assembled were not comparable (for example, elective repeat caesarean patients were not eligible for trial of labour); if classification of uterine rupture was unreliable or invalid, or classification was not applied equally among groups; if key confounders, such as number of caesarean deliveries or direction of prior caesarean (vertical or transverse) were given little or no attention; if there was differential attrition or, for randomised control trials, if intention to treat analysis was lacking. A study received a fair rating if generally comparable groups were assembled but some question remained whether minor differences occurred in follow up; if measurement of uterine rupture was acceptable (for example, no definition but study details allowed for classification) and generally applied equally; if some, but not all, potential confounders were accounted for; and for randomised controlled trials, if intention to treat analysis was performed. As results from fixed effects and random effects models did not differ, we present the results from the random effects models. We identified 4867 citations, reviewed 568 full text articles, and identified 21 studies of fair to good quality (fig 1). We excluded 497 studies because they did not meet inclusion criteria. No articles written in languages other than English met the inclusion criteria. Of the 71 studies considered potentially eligible, 50 received a poor rating (16 for two or more reasons). The included studies consisted of two large, population based retrospective studies,2 12 15 prospective cohort studies,13–27 two case-control studies,28 29 and two case series30 31 (table 1). Cohort studies defined the trial of labour group as women who had had a caesarean delivery (sometimes including women with scar of unclassified origin or low vertical scar) who had a trial of labour ending in vaginal or caesarean delivery. Often the repeat caesarean group was defined as women without a trial of labour (sometimes including women for whom caesarean section was indicated). Terms describing severity of rupture were used inconsistently; the term “dehiscence” usually signified incidental findings of a scar defect at caesarean or uterine exploration after vaginal delivery, but in three studies14 21 28 it also included symptomatic ruptures. Thirteen studies used the terms “complete uterine rupture” or “true uterine rupture,”2 12 13 15–19 22 23 29–31 but these gave inconsistent definitions: separation requiring operative intervention (for example, emergent caesarean for maternal bleeding or fetal heart rate abnormality with scar separation); extrusion of fetus at caesarean for failure to progress; scar with bleeding, haematoma formation, or extrusion of fetus; or exclusively for separations with serious maternal or infant consequences (hysterectomy or death). Ten of 11 observational studies provided the best evidence on the occurrence of symptomatic rupture (table 2).2 13–18 20 22 23 Symptomatic rupture rates in prospective cohort studies ranged from 0/1000 in a small study20 to 7.8/1000 in the largest,16 with a pooled rate of 3.8 (95% confidence interval 1.3 to 6.2) per 1000 trials of labour. Only one retrospective and one prospective study provided comparative data for symptomatic rupture in trial of labour versus elective repeat caesarean (fig 2).2 18 When combined, these data show an additional risk of 2.7 (0.73 to 4.73) symptomatic ruptures per 1000. Perinatal deaths—Classification and reporting inconsistencies make it difficult to assess the risk of perinatal death due to rupture. Six cohort studies14–16 18 20 23 including from 162 to 5022 trials of labour reported no perinatal deaths related to rupture; three other cohort studies (3957,17 3249,2 and 1796 trials of labour22) reported rates of 14% (1/7), 20% (2/11), and 60% (3/5),2 17 22 and two case series reported rates of 6% and 4%.30 31 Overall, six deaths were reported in 74 symptomatic ruptures, corresponding to an additional 1.4 (0 to 9.8) perinatal deaths per 10 000 trials of labour.2 13–18 20–23 30 31 By contrast, an analysis of linked data from the Scottish Morbidity Record and Stillbirth and Neonatal Death Enquiry found 20 perinatal deaths among 15 515 trials of labour compared to none among 9014 planned caesareans.12 Their rate of 12.9 (7.9 to 19.9) per 10 000 is almost 10 times higher than our estimate. The death rate for trial of labour (20 perinatal deaths: 8 in vaginal deliveries and 12 in emergent caesarean deliveries) may be spuriously high—and that for repeat caesarean delivery spuriously low—because all emergent caesarean deliveries and vaginal deliveries were classified as trials of labour regardless of intended delivery route. In a separate study, two of nine (22%) emergent caesareans were in women who requested repeat caesarean.21 If this proportion were applied to the Scottish study, three of the 12 emergent perinatal deaths would have occurred in the planned repeat caesarean group, and the difference would no longer be statistically significant. Hysterectomy—In the five cohort studies reporting on hysterectomies related to rupture, seven hysterectomies occurred in 60 symptomatic ruptures (13%; 4% to 27%).2 14–17 These data indicate that 3.4 (0 to 12.6) per 10 000 women choosing trial of labour sustain a rupture that would necessitate hysterectomy. Oxytocin use was associated with a twofold to fourfold increased risk of uterine rupture in two case-control studies.28 29 This finding has not been confirmed in cohort studies or controlled trials. In prospective cohort studies, the use of oxytocin13 21 23–25 or prostaglandin26 27 was not associated with a higher risk of uterine rupture. Abnormalities in fetal heart rate were the most common sign of rupture, occurring in 55-87% of uterine rupture events. Other signs reported were vaginal bleeding, pain, and disturbances of uterine contractions. This report aimed to answer a question on the minds of patients, providers, and policy makers: what additional risks does a woman who has had a caesarean delivery assume if she chooses to attempt vaginal delivery rather than have a caesarean section? Most of the literature focuses on the risk of uterine rupture in the trial of labour group, with an implicit assumption that this risk would be eliminated by elective repeat caesarean delivery. If this assumption were true, it would take 263 elective repeat caesareans to prevent one uterine rupture due to trial of labour. However, elective repeat caesarean delivery is not guaranteed to prevent uterine rupture. In two comparative studies, trial of labour posed an additional risk of 0.27% (2.7/1000; 95% confidence interval 0.73 to 4.73)2 18; thus it would take 370 (213 to 1370) elective repeat caesareans to prevent one symptomatic uterine rupture due to trial of labour. Patients are also concerned about additional morbidity. About 5% of symptomatic uterine ruptures were associated with perinatal mortality and 13% with hysterectomy. This translates to 7142 elective repeat caesareans to prevent one rupture related perinatal death and 2941 to prevent one rupture related hysterectomy. It would take only one misclassified case of symptomatic uterine rupture in the smaller study and five in the largest2 to entirely negate the observed difference in symptomatic uterine rupture between groups. Caution must be used in interpreting these results. Serious morbidity or mortality due to uterine rupture is rare, making it difficult to study. As a result, studies have focused on the occurrence of uterine rupture rather than how often bad outcomes result from it. The existing evidence is sufficient to conclude there is an increased risk of symptomatic uterine rupture for trial of labour over elective repeat caesarean and that caesarean delivery is not completely protective. However, most uterine ruptures do not have serious consequences, and patients and clinicians may wish to base decisions on the likelihood of significant morbidity or mortality for the mother and baby rather than on the occurrence of uterine rupture itself. We found insufficient evidence to make a reliable estimate of the risk of uterine rupture when oxytocin or prostaglandins are used during labour. There is a temptation to make a conclusion on the use of prostaglandins to induce trials of labour, especially with the large effect reported by Lydon-Rochelle et al (relative risk of uterine rupture 15.6; 8.1 to 30).3 We excluded this study because the use of ICD-9 codes to identify uterine rupture has been shown to be only about 40% accurate.11 If the Lydon-Rochelle study missed 60% of cases, we would still expect to find a significant increase in uterine rupture among women receiving prostaglandins: studies using better methods of identifying ruptures produce a relative risk of approximately 6. Prostaglandins did not increase the risk of uterine rupture in other observational studies. Although the studies we reviewed were much smaller, overall the number of women receiving prostaglandins was similar in the largest cohort study included and the Lydon-Rochelle study. Whether prostaglandins really increase the risk is still open to question. The relation between fetal heart rate disturbances and uterine rupture is unclear. Studies examining the relation between duration of fetal heart rate disturbance, particularly prolonged bradycardia and adverse perinatal outcomes, report conflicting results. Because the definition of uterine rupture often includes uterine ruptures that are discovered when a caesarean section is done because of fetal heart rate disturbances, it is impossible to determine the accuracy of fetal heart rate as a premonitory sign. Finding a uterine wall defect in this context does not necessarily signify that the defect was the cause of the fetal heart rate abnormality or that morbidity in the infant would be attributable directly to rupture. Existing studies do not permit a precise estimate of the frequency of serious events, which occur once in every 1000-10 000 deliveries. A randomised trial of this question would have to be huge and might fail if women preferred to make their own decision rather than accept a random assignment to trial of labour or elective repeat caesarean. For an observational study, the major challenges are to accurately classify exposures (trial of labour, elective repeat caesarean, induction, and augmentation) and outcomes (rupture related events). Attempts have been made to classify a labour after delivery as a trial of labour or elective repeat caesarean, but these are fraught with bias. For example, women who intend to have a trial of labour but undergo early labour and decide on caesarean section are difficult to distinguish from women who “fail” trial of labour. Accounting for differences in the time of exposure is important, since women who choose elective repeat caesarean commonly deliver before 40 weeks whereas women choosing trial of labour may deliver up to 43 weeks. Although degrees of measurement bias and misclassification are unavoidable, a multicentre prospective cohort study or national registry would offer the best opportunity to guide the design of effective preventive strategies. Meanwhile, this review indicates that there is less than a 1% chance that a woman with a low transverse caesarean scar or scar of unclassified origin will sustain a uterine rupture as a consequence of attempting vaginal delivery; that elective repeat caesarean does not always prevent uterine rupture; and that for more than two thirds of women who experience a uterine rupture, neither they nor their infant will have severe health consequences related to uterine rupture. Contributors J-MG and MSMcD contributed to the conception and design and analysis of data and drafting and revising of the article. PO contributed to the design and assembly of data, drafting and revising of the article, technical support. PN contributed to the design, revising of the article, and technical support. BKSC contributed to analysis of data, drafting and revising of the article, and statistical expertise. MH contributed to conception and design, interpretation of data, drafting and revising of the article. J-MG, MSMcD, PO, and MH approved the final version. J-MG is guarantor. Funding This study was conducted by the Oregon Health & Science University Evidence-based Practice Center under contract to the Agency for Healthcare Research and Quality, Rockville, MD (contract 290-97-0018, task order No 9). Support for J-MG was also provided by the Agency for Healthcare Research and Quality grant No 1 K08 HS11338-01. .Conservatism in obstetrics.N Y Med J1916; 104:1–3. .Comparison of a trial of labor with an elective second cesarean section.N Engl J Med1996; 335:689–95. .Risk of uterine rupture during labor among women with a prior cesarean delivery.N Engl J Med2001; 345:3–8. .Vaginal delivery after cesarean section—is the risk acceptable? [letter; comment].N Engl J Med2001; 345:54–5. .Once a cesarean, always a controversy.Obstet Gynecol1997; 90:312–5. .Putting elective cesarean into perspective [comment].Obstet Gynecol2002; 99:967–8. .Vaginal birth after cesarean (VBAC). Evidence report/technology assessment (prepared by the Oregon Health & Science University Evidence-based Practice Center under contract N. 290-97-0018). Rockville, MD:Agency for Healthcare Research and Quality Publication,2003. Cesarean childbirth: report of a consensus development conference sponsored by the NICHHD in Conjunction with the National Center for Health Care Technology and assisted by the Office for Medical Applications of Research.NIH Publication.1981; 82–2067. .Current methods of the US Preventive Services Task Force: a review of the process.Am J Preventive Med2001; 20(suppl): 21–35.
. Study quality assessment. Undertaking systematic reviews of research effectiveness: CRD's guidance for those carrying out or commissioning reviews.York:NHS Centre for Reviews and Dissemination,2001. .Use of hospital discharge data to monitor uterine rupture—Massachusetts, 1990-1997; US Department of Health & Human Services.MMWR Morbid Mortal Wkly Rep2000; 49:245–8. .Risk of perinatal death associated with labor after previous cesarean delivery in uncomplicated term pregnancies.JAMA2002; 287:2684–90. .Trial of labor following cesarean delivery.Obstet Gynecol1994; 83:933–6. .Outcome of trial of labor in patients with a single previous low transverse cesarean section for dystocia.Obstet Gynecol1988; 71:380–4. .Vaginal birth after cesarean section: results of a multicenter study.Am J Obstet Gynecol1988; 158:1079–84. .Elective repeat cesarean delivery versus trial of labor: a prospective multicenter study.Obstet Gynecol1994; 83:927–32. .Vaginal birth after cesarean delivery: results of a 5-year multicenter collaborative study.Obstet Gynecol1990; 76:750–4. .Vaginal delivery following previous cesarean birth.Am J Obstet Gynecol1983; 146:255–63. .Trial of labour following prior section: a 5 year prospective study (1982-1987).Eur J Obstet, Gynecol Reprod Bio1989; 31:109–17. .Trial of labor following cesarean section: a two-year experience.Am J Obstet Gynecol1982; 144:671–8. .Trial of labor in the patient with a prior cesarean birth.Am J Obstet Gynecol1985; 151:297–304. .Vaginal birth after cesarean.Am J Obstet Gynecol1987; 157:1510–5. .Trial of labor in previous cesarean section patients, excluding classical cesarean sections.Obstet Gynecol1987; 70:713–7. .Is vaginal birth after cesarean safe? Experience at a community hospital.Am J Obstet Gynecol2001; 184:1478–87. .Oxytocin during labor after previous cesarean section: results of a multicenter study.Obstet Gynecol1987; 70:709–12. .Prostaglandin E2 for cervical ripening: a multicenter study of patients with prior cesarean delivery.Am J Perinatol1997; 14:157–60. .Prostaglandin E2 gel induction of patients with a prior low transverse cesarean section.Am J Perinatol1992; 9:80–3. .A five year review of scar dehiscence in the Rotunda Hospital Dublin.Irish Med J2001; 94:176–8. .Risk factors associated with uterine rupture during trial of labor after cesarean delivery: a case-control study.Am J Obstet Gynecol1993; 168:1358–63. .Uterine rupture after previous cesarean delivery: maternal and fetal consequences.Am J Obstet Gynecol1993; 169:945–50. .Neonatal morbidity associated with uterine rupture: what are the risk factors?Am J Obstet Gynecol2002; 186:311–4.